We came across a beauty of a shop on our daytrip to Luzern the other day (well to be honest quite a few but this one's colour-scheme was particularly photogenic). I should have taken more pictures but the shop owner was hovering around and I'm never quite sure if my snapping at their wares and stylish displays is that much appreciated. Then again we all know it ends up here, on t'interweb. Once, on a city-break to Munich visiting my father, I was very snap-happy in a store of sorts (remember this?) and was given a right old telling off for my impertinence. The Bavarians are ever so slightly tetchy though, so I should have seen it/her coming. I tried in vain to explain that I wasn't there to copy or rip off but just to praise and promote. She wasn't having any of it and and it turned into a bit of a mind battle. There was me hoping for closure on what seemed such a trivial misunderstanding. By this I mean a simple smile, signalling her delayed appreciation ie. trust in my regard, but looking at the icy stare, I knew that was about as likely as seeing the Pope in a pair of Lederhosen. I stomped off in frustration. So much for closure. I wonder whether her insistence with me and other visitors will ultimately pay off. 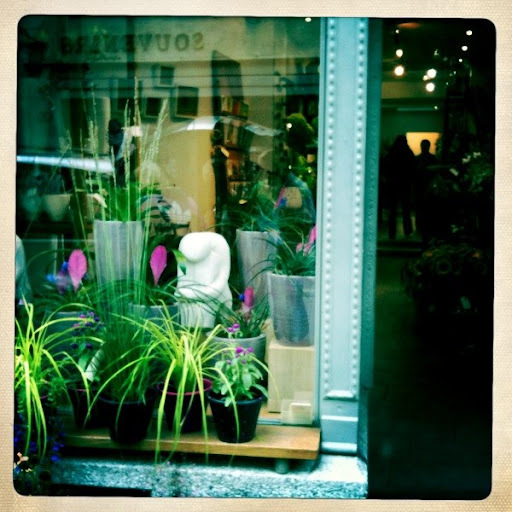 Anyway, in Luzern it was fine, the owner of the above pictured flower shop actually smiled and was not at all bothered. The shop was Blütenblatt and can be found in one of Luzern´s most charming quarters, in the Kleinstadt.